Houch was living and working on the streets in Battambang when he saw a Tiny Toones performance in the town. 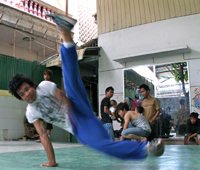 The breakdancing and the Tiny Toones team made such an impression on him that he made his way to Phnom Penh – some 300km away – even though he was only 14 years old. Once at Tiny Toones Houch found a new family that would help him with more than just his dance moves. He had dropped out of school at a very early age and found it strange to be back in a classroom at Tiny Toones learning Khmer and English. None-the-less, with financial and emotional support from Tiny Toones he returned to school and completed grade 8 earlier this year, at the age of 17. Without Tiny Toones Houch says he would still be living on the streets in Batambang, trying to make enough money to buy drugs. Instead he is catching up on his missed schooling and volunteering at Tiny Toones, keeping an eye on the younger kids during break periods and helping out with creative classes. He has even danced on national TV with Tiny Toones up-and-coming ‘junior’ team.